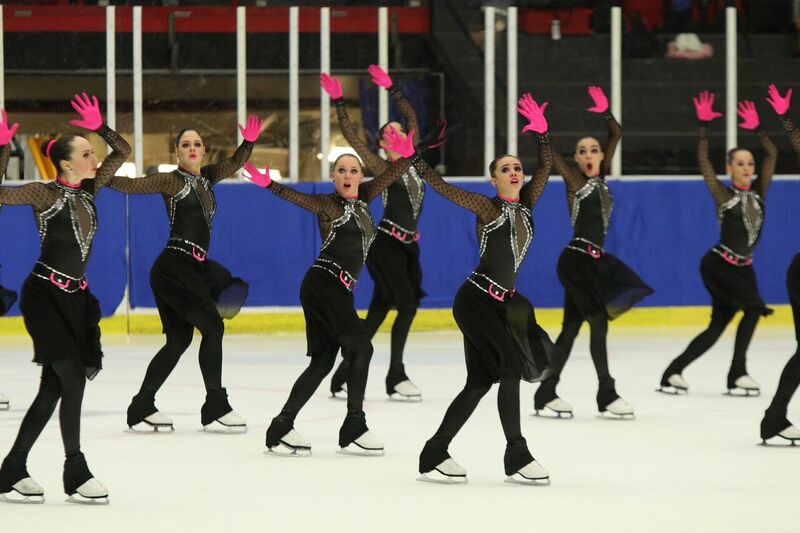 Senior, Junior, and Advanced Novices... On Sunday, the participating teams presented their free program in front of the Swedish audience. The second day of Leon Lurje Trophy started with Advanced Novice category Free Skating. The eight teams skated again their Free Program and the combined score with the first day result determined their final position. Teams mostly maintained their positions after the second skate. Russian Team Sunrise 2 improved further to their already good performance before (62,25, up from 61,62) and defended their champion title in Novice category with a total score of 123,87 points. Runner up is Team Starlights who improved a few points (60,29, up from 55,90) and earned a total of 116,19 points. The bronze medalist Swedish Team Karisma kept their position after earning 92,16 points from their two skates. At the fourth position is Finnish Team Dream Steps who earned 41,83 points on the second day, a bit less than the day before (45,64). Their combined total is 87,47 points. The fifth and sixth positions swapped after the second skate. Team Seaflowers improved by about 5 points (from 35,47 to 40.80), placing them at the overall fifth position (total: 76,27 points) displacing Team Together (total: 75,22). Team Limelight and Team Harmony ended with total combined scores of respectively 66,50 and 57,00 points. For the Junior category, the audience watched the 10 teams performing their Free Skating programs. All teams tried very hard to advance their ranking in the Trophy. 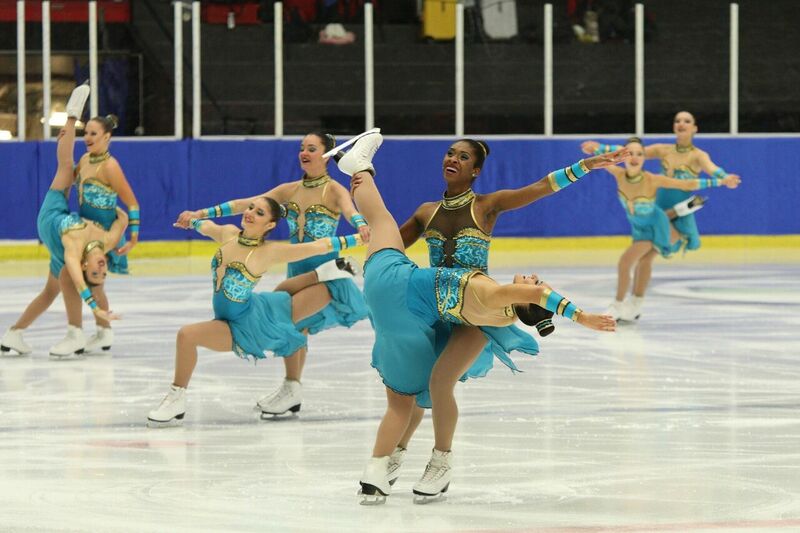 The competition was fierce among Canadian Les Suprêmes Junior and Russian Sunrise 1. On the first day, the Russian team was ahead of the rest, beating Les Suprêmes Junior by 2,14 points. When it came to Free Skating, the Canadian team dressed in black with eye-catching pink gloves delivered their program which was loosely based on “Mission Impossible” theme music and other songs, and earned 97.00 points beating Sunrise 1 by 5,99 points. 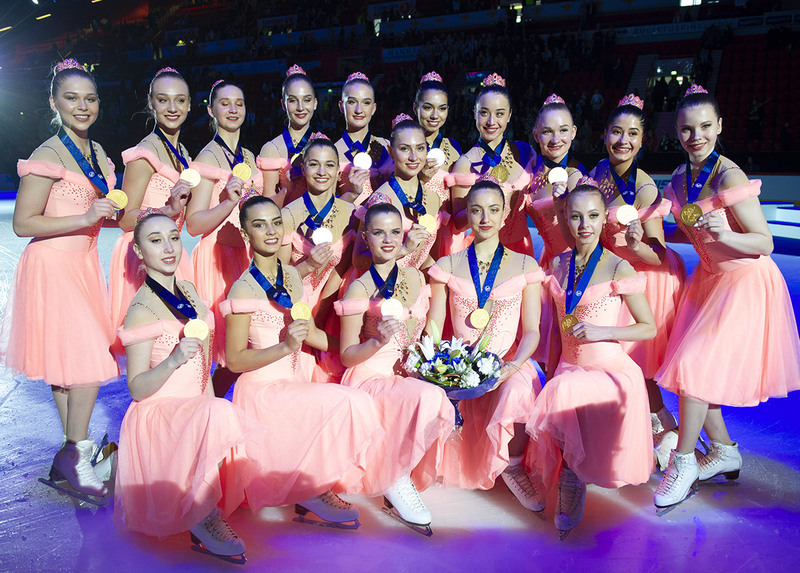 At the end, Les Suprêmes Junior won the gold medal with a total of 152,88 points. Sunrise 1 well earned their silver title with 149,03 points. Sunrise 1’s Free Skating program was based on “Bandidas”. Competition among the third and fourth place holders Canadian team Les Pirouettes and Finnish Sun City Swing was even more fierce. After the first day, their difference in Short Program scores was only 0,73 points. Their Free Skating scores were also very close. Despite the 2-point deduction from falls and excessive interruption, Les Pirouettes still beat Sun City Swing by 0,2 point in Free Skating. At the end, Les Pirouettes obtained a total of 129,50, which was 0,93 point higher than that of Sun City Swing (total: 128,57 points), and won the bronze medal. 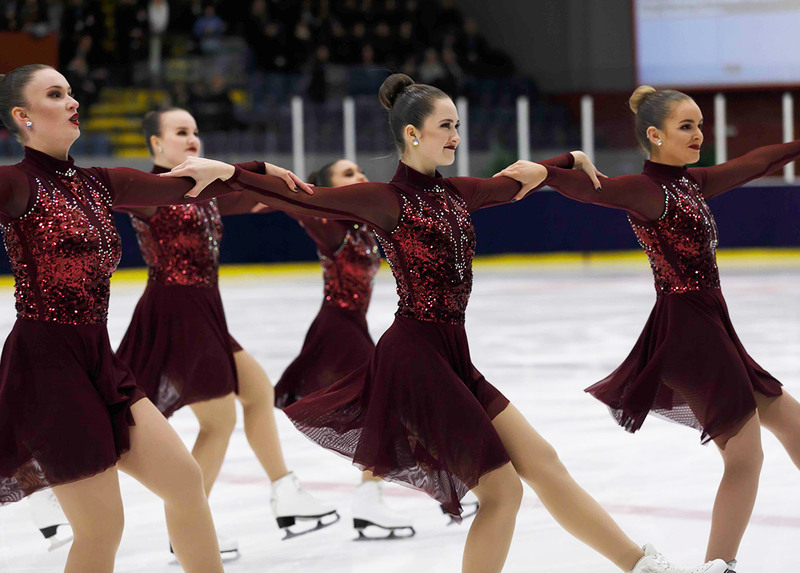 Hockettes, Ice Steps, Team Spirit and Team Convivium (in the descending order of the fifth to eight positions after Short Program) had tough competition among themselves too. While Hockettes with their program “Soundtracks from PAN” defended their fifth position in Free Skating (72,70 points), Team Convivium improved their skating and went ahead of Ice Steps and Team Spirit. Team Convivium attained the sixth position on the second day with a Free Skating score of 72,02 points. Team Spirit and Ice Steps respectively earned 71,37 and 66,36 points. And so after two days of competition, the overall fifth to eighth positions were secured by Hockettes (total: 116,34 points), Team Convivium (total: 113,94 points), Team Spirit (total: 113,56 points) and Ice Steps (total: 108,76 points). Team Nova presented an interesting program of “Pantomime” which was full of theatrical performance elements and earned 59,55 points. Their total combined score was 91,70. Team Moonlights received a total of 81,51 points from their two performances. The Senior category competition was certainly the pinnacle of the two-day event. The spectators joyfully danced to YMCA and other songs as they eagerly anticipated Senior category competition. Short Program leader Finnish Rockettes once again delighted the audience with their Free Skating program “Theme Valkyria”, which included many difficult maneuvers but managed to appear deceptively effortless by their skaters who were full of heartfelt expression. However, they had a fall which deducted them 1 point. They obtained 125,07 points from their Free Program. The strong champion contender USA Haydenettes was beaten by Rockettes in Short Program (67,02 vs 69,26) but did not lose heart and kept fighting till the end. 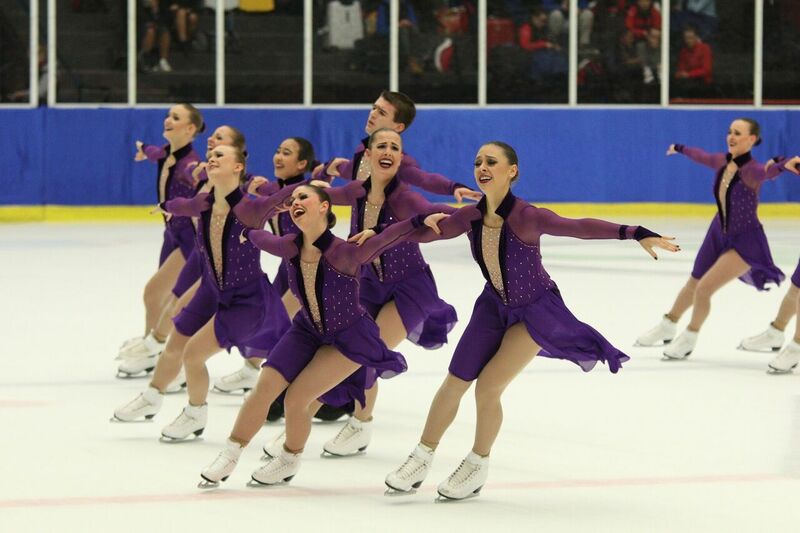 They skated their energetic program “Prince Medley” perfectly and earned the Free Skating winning score of 126,30 points. Unfortunately, that was not enough to close the gap between them and Rockettes. Rockettes kept the overall champion title with a total score of 194,33 points and Haydenettes returned home with the silver medal after obtaining a total of 193,32 points. Les Suprêmes Senior maintained their third position after skating their program “Alive” and earning 122,54 points. Their combined score 181,91 helped them secure the bronze medal. It was sad to see home team Team Boomerang had a few falls and received a deduction of 5 points. At the end they received 77,84 points, losing the fourth position to USA’s Adrian College Varsity SST who received 94,23 points from their program “Evita” which was delivered with full passion and energy. Adrian College Varsity SST ended up with a combined score of 137,26 points in the overall fourth place while Team Boomerang was at the fifth place with 121,02 points. Turkish Team Vizyon skated to their “Rebel” program. As Turkish team had 3 male skaters, the audience had an opportunity to see a pair of male skaters doing the death spiral, which was a sight not seen very often in synchro. Their program received 46,06 points. 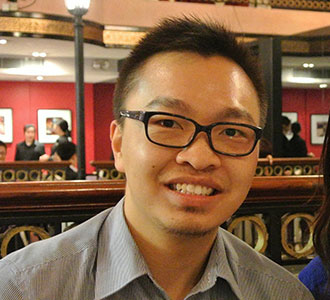 This placed them in the seventh place with a total score of 73,73 points. Wight Jewels performed “Lion King medley” program and impressed the audience with a distinctive sunset yellow gradient dress. They scored 41,57 points. Their total score was 65,52 points. Day 2 ended with an award ceremony for the Novice, Junior and Senior categories. Congratulations to all teams!? ?Hopefully, some of the Senior teams will meet again in World Championships in Mississauga (Junior category) and Colorado Springs (Senior category). While memories of Leon Lurje Trophy are still fresh in the head, having seen the high caliber of many teams the audience cannot wait to see them again delivering their very best to judges and spectators.